The Hilton Dallas Lincoln Centre hotel is Four Diamond Luxury with a premier Dallas address-most notable for its proximity to the Dallas Galleria Mall. Whether traveling on business or pleasure, we invite you to experience our award-winning hospitality. This Hilton hotel is only 20 minutes from both DFW and Love Field Airports and just minutes from restaurants, entertainment and major business destinations. Wireless high-speed internet access is available in all guest rooms and public areas of the Hilton Dallas Lincoln Centre hotel. All meeting spaces are hard-wired with microwave networking technology that provides internet access at speeds faster than T1 lines. The Hilton Dallas Lincoln Centre guestrooms have been lavishly decorated to offer the very best in comfort and ambiance. The highlight of all rooms is the Hilton Serenity Collection, which features the ultra-luxurious Bed by Hilton, exclusive Crabtree & Evelyn bath amenities and a state-of-the-art alarm clock/radio with MP3 compatibility. Hilton Dallas Lincoln Centre hotel with lush grounds are an oasis from city hustle and bustle and feature a four-acre lake surrounded by a jogging trail with outdoor pool and sun deck. 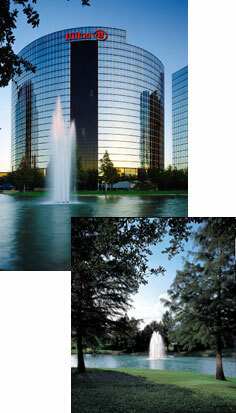 The Hilton hotel offers the perfect retreat from the urban jungle. The Hilton Dallas Lincoln Centre dining options include Crockett's Restaurant serving breakfast, lunch and dinner and Cricketers, an eating and drinking establishment for lunch, dinner and happy hour. L'Express serves Starbucks coffee, breakfast pastries and lunch. Complimented by 24 hour in-room dining service, the Hilton Dallas Lincoln Centre offers a wide array of cuisine choices. The Hilton Dallas Lincoln Centre, offers the finest in quality guest accommodations, friendliest customer service and a premier Dallas location...It Happens at the Hilton!